Good and kind of heart. And watched him as he grew. No one except God knew. So eventually he would fall. But he chose the handsome, eldest one. “No!” the Lord said, “You are wrong! I don’t choose by looks alone. And God gave him great power. So that as a king he’d tower. They couldn’t live in peace. As strong and tall as the trees. But defeat would slavery bring. To fight this terrible giant. And the war went on defiant. To his brothers, he came with food. And the chance to stop the feud. 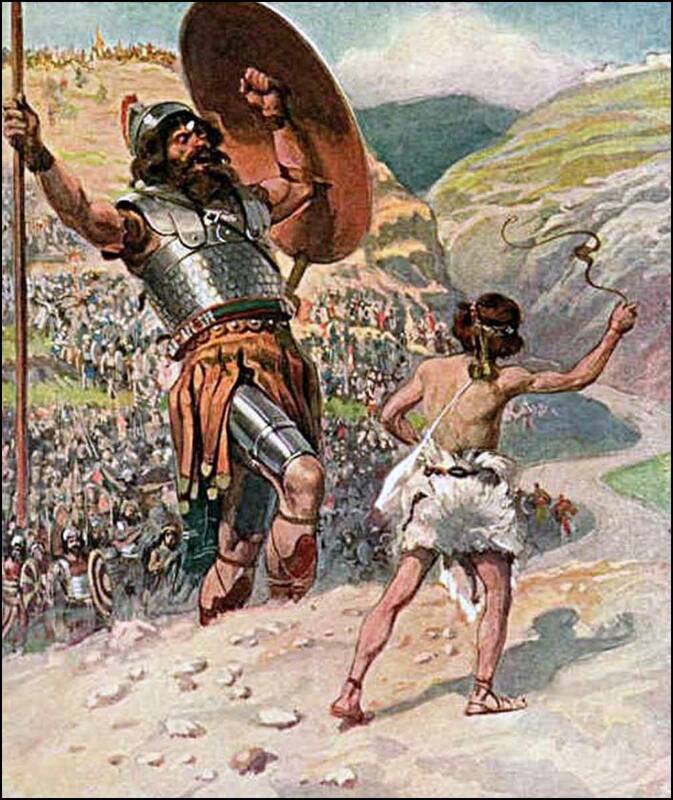 “I’ll fight the giant,” said David. The Lord was on his side. But Saul said, “You’re just a shepherd boy. Said, “I’ve killed a lion and bear. That David said he didn’t need. And to see Goliath win. He was too small and thin. Of the bigger, stronger giant. And reached into his sack. As befit a future king. Fell dead before their eyes. And made the Heavens ring. From David, the Israelites’ new king. Thank you, Paula. I love writing story poems. t enables you to get a tale across effectively in fewer words. So glad you enjoyed my version of this timeless tale. Thank you for the wonderful compliment, Shauna. Whether we are religious or not some Bible stories just need to be retold. John, as you, I'm a Christian, but prefer to practice in my own way. I'm not big on church and don't read religious-laden material. This, however, was a joy to read. The flow is beautiful. You're a poetic storyteller, John. Thank you, Lawrence. It is one of the truly iconic Bible stories told my poetic way. Glad you enjoyed this. Really enjoyed this re-telling of the story. Always liked this narrative. Nice that the little guy wins this time. Excellent poem, does the story justice. True, but sometimes it does, and gives us all hope. Not usually how things turn out in the real world, but it's sweet when it does. Thank you for your kind comment as always, Devika. Much appreciated. 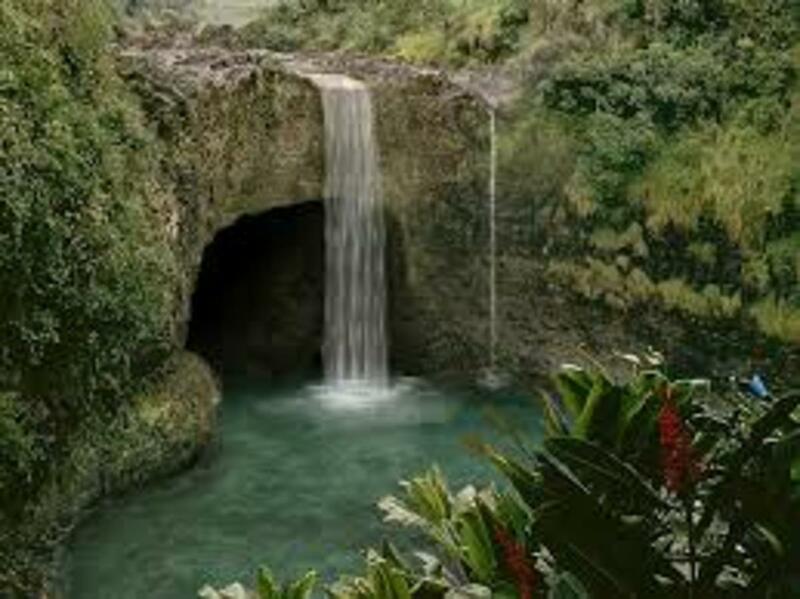 Hi Jodah as always you share your great talent and with the correct words of expression. Hi Yves, thank you for reading and sharing that interesting information. It adds value to the hub. Just two days to go. Will David and Goliath pass the test? I will ask you for some rights as it is a great teaching piece. Let us see what the teacher Ms. Nguyen thinks. Enjoyed your poem, Jodah. It focuses on the spiritual element of the story very nicely. Well done. Did you know that a skilled stone/sling thrower with accurate aim, in Biblical times, actually owned a lethal weapon? Once you get the sling swinging powerfully above the head and then let aim, the stone is very fast and quite deadly. @ Frank Thank you for the kind comment. This one was quite a challenge. Well written! I like the poetic take on a classic. Thank you MsDora. That is the aim of most of my poetry to make lessons easier to learn or remember. Your kind remarks are much appreciated. I'd love to hear my grandson or any other brave child recite this poem. The content and the style is A plus. Great poetry which can provide great teaching moments. Thank you. I agree, Dave. Your name-sake sure overcame remarkable odds. Thanks for reading. I can remember watching that movie many years ago, rj. Yes, Biblical movies were once the real epics. Not so long ago I wrote a poem about Sampson and enjoyed the challenge so I thought I'd try my hand at another Biblical story. Thank you for reading this Linda. I am glad you enjoyed it. Thanks for this poem, seems amazing that such a huge man as Goliath could be slain by a small, thin David with just a sling. Strange coincidence. I just watched the film version of David and Bathsheba, starring Gregory Peck and Susan Hayward done way back in 1951. No one could make a film like this today. There was a time when Biblical stories were ripe for Hollywood production, but today... not very likely. 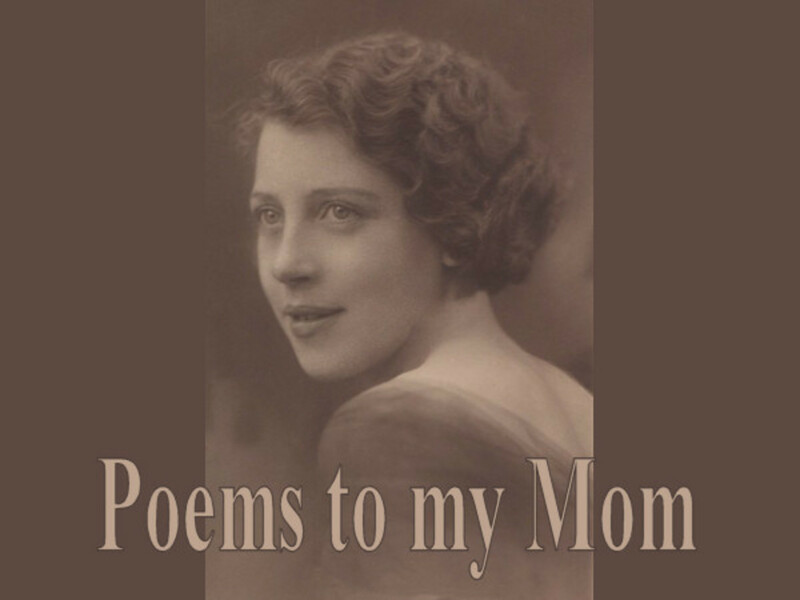 If I may encroach upon you a bit, what was percolating in your mind when you wrote the poem? This is an interesting story that you've told very well. I enjoyed reading your poetic version of the tale! Thank you MizB. You confirmed why I missed writing here, and why I am back. Yes, a stone in a sling and wielded by someone with skill is an effective weapon and not to be taken lightly. Thank you for sharing that. This really is a wonderful rendition of the story of David and Goliath, one of my favorite Bible stories. I just finished reading your troll poem and called it my favorite, but I think this one topped it on my list. BTW, recently some people were laughing because kids in the Middle East were throwing stones at people they considered enemies. They were told that these kids were not "throwing", they were using slings like the one David used to kill Goliath. That kids in the Middle East with stones were serious business. Your poem just proved that. Good work, my friend. Dang John why didn't someone whip out an Iphone!!! Thank you, Lori. Well, I always loved the story that's for sure. I have now written this and Sampson in verse. If there is another or will probably be the story of Daniel. Thank you for your kind words and for that suggestion Mary. Yes, it would be great to see children reciting this poem to help them learn the story. Thank you Shyron. Wouldn't it be wonderful to have the whole Bible rewritten in rhyming verse? Too big a job for me though in my lifetime.Blessings. Thank you for appreciating this poetic version of the story Harish. Glad you enjoyed it. Bill, Thank you for the kind welcome back. It feel good to be publishing here again. I've been quiet but never left. Hello, Eric and Gabriel. Yes, I think it would be cool if Goliath was a cyclops as well. As far as we know he may have been lol, we don't have any pictures proving otherwise. Fantastic. 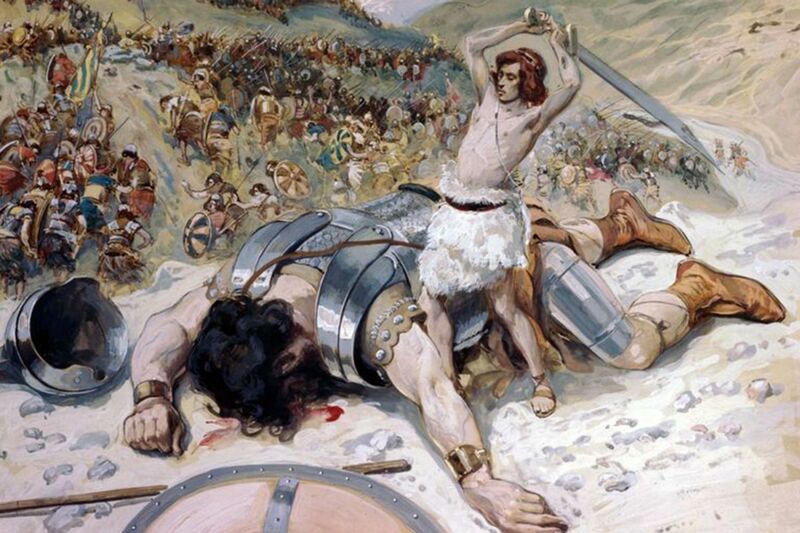 Who doesn't love the David and Goliath story? Well done. This would be perfect for a Chorus in a performance. I could see students reciting this poem learning the story at the same time. It is much more fun. John, I love, love it, this is beautiful and if you wrote the whole Bible this way, everyone could understand it. Great story, John. I love how beautifully you told it all through such a simple , yet very effective poem. I enjoyed the poem. It's so good to have you back. Too much talent has left HP, so it at least feels good for a little while knowing one talented writer returned to the fold. Hello John. Good to see you publish. (I should talk.) Setting a bible story to rhyme, that is clever and I bet proved challenging. My boy Gabriel says hi and thank you. He thinks that Goliath should be a Cyclops. I asked what difference it would make and he said it would be more cool. The cadence here is awesome. Thank you, Louise, much appreciated. 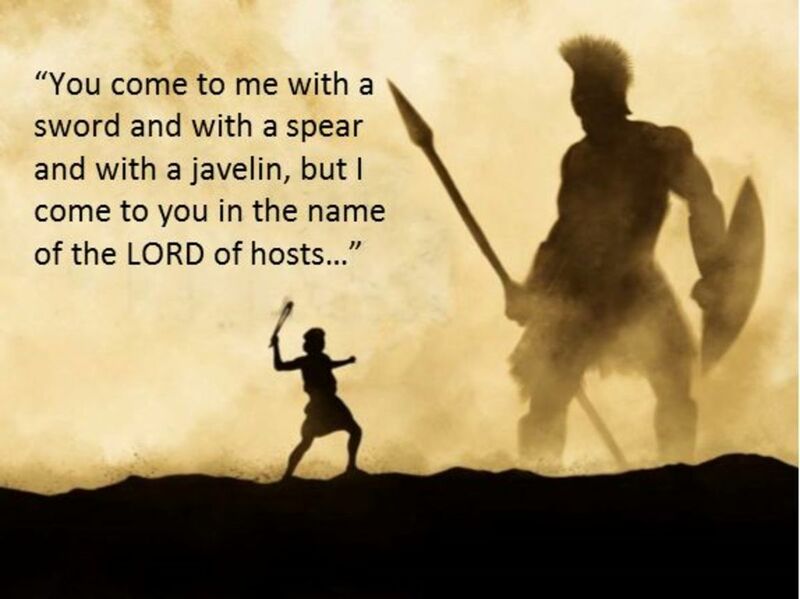 That's a really good poem about David and Goliath. I love that Bible story.